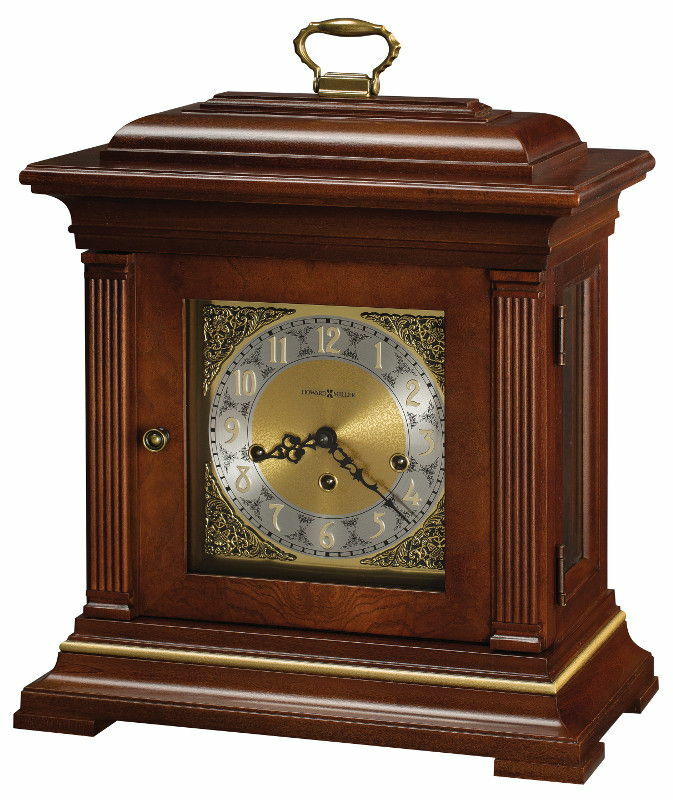 Presidential Collection clock features an arch molding that crowns the case. 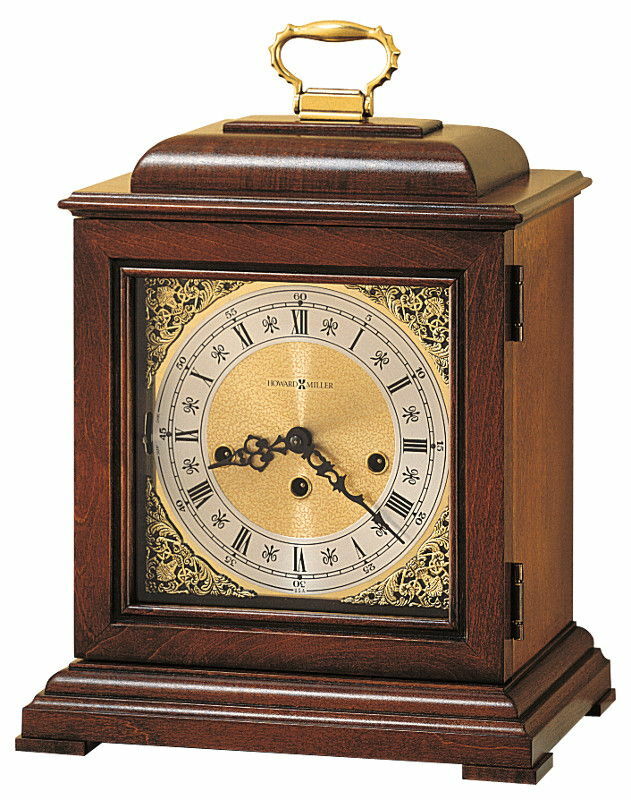 Two triangular rare crotch mahogany and movingue overlays accent the dial. Key-wound, triple-chime German Kieninger movement plays choice of Westminster, St. Michael, or Whittington 1/4, 1/2, and 3/4 chimes accordingly with full chime and strike on the hour. 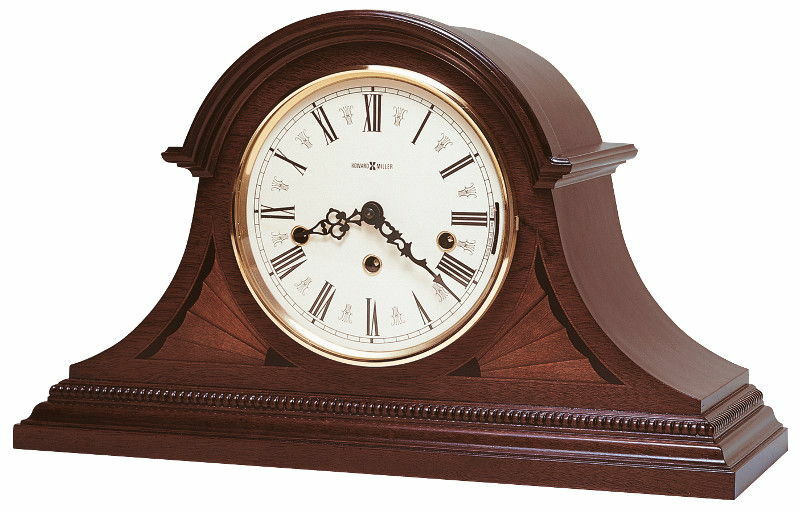 A classic tambour silhouette with beautiful details give these chiming mantel clocks a unique presence in any room. 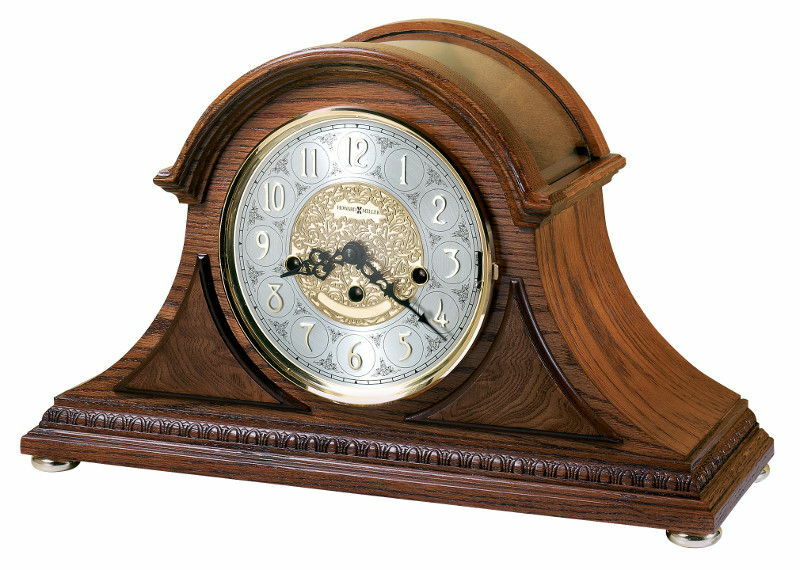 The base features a decorative molding that wraps around three sides of the clock, while detailed, bookmatched leaf and rosette patterns flank the bezel and dial. The aged dial features Roman numerals, black spade hands, convex glass and a hinged bezel. Key-wound, Westminster chime German Kieninger movement plays 1/4, 1/2, and 3/4 chimes accordingly with full chime and strike on the hour. 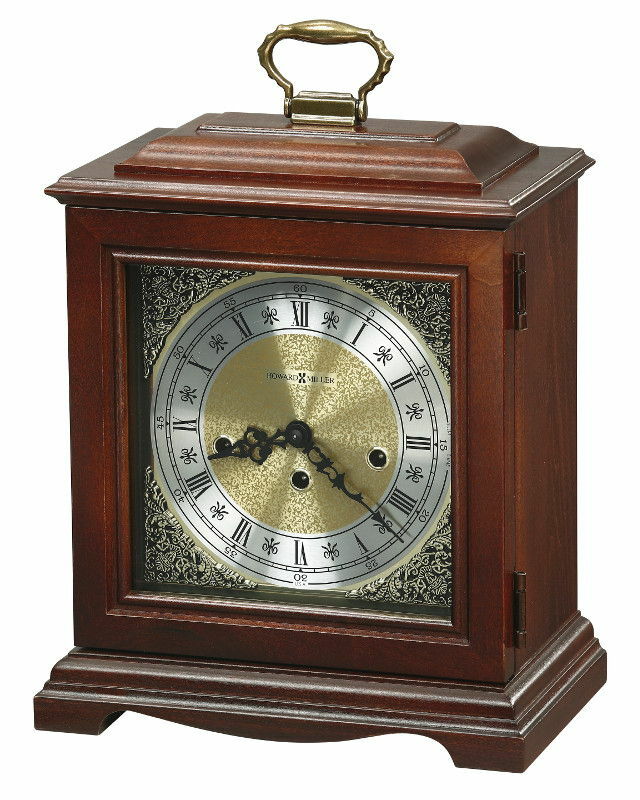 An industry exclusive duel-ratchet winding arbor ensures safe movement winding on these mantel clocks. 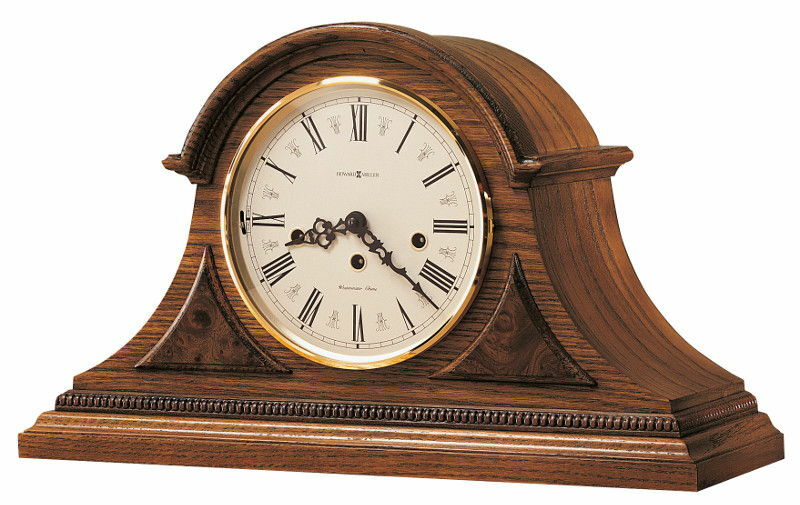 An industry exclusive dual-ratchet winding arbor ensures safe movement winding on these mantel clocks. 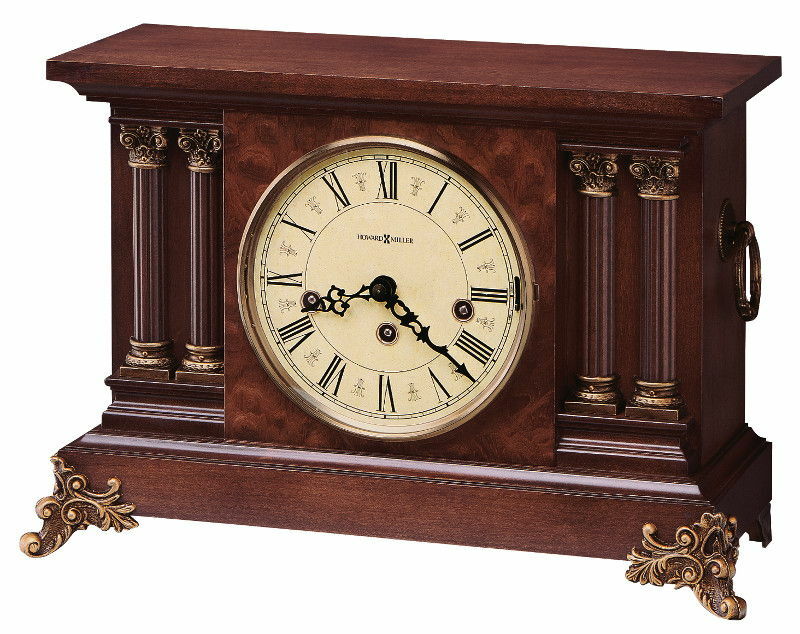 Beaded dentil molding adds character to the strong plinth base on these chiming mantel clocks. 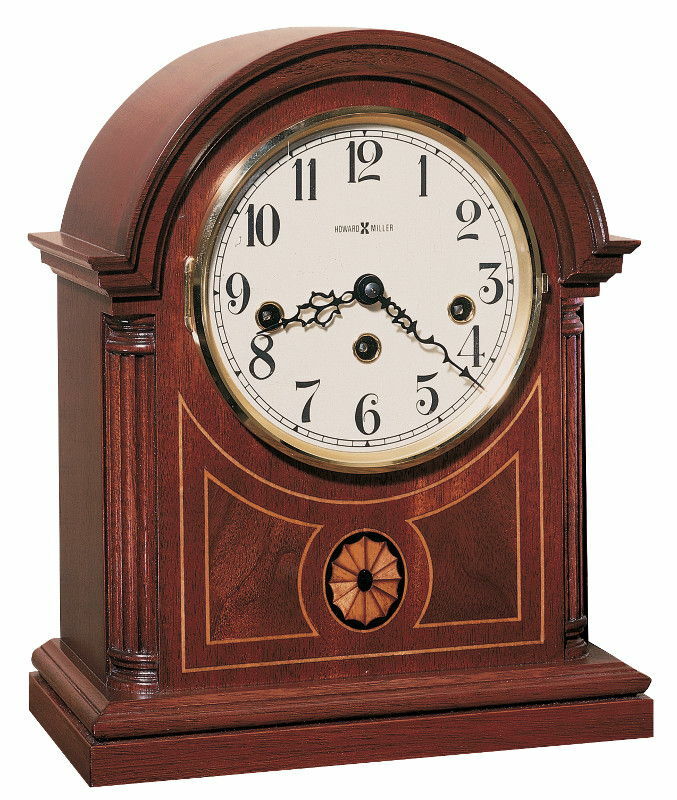 These tambour mantel clocks feature decorative egg-and-dart molding that wraps around the base, and rare olive ash burl overlays accenting the front. 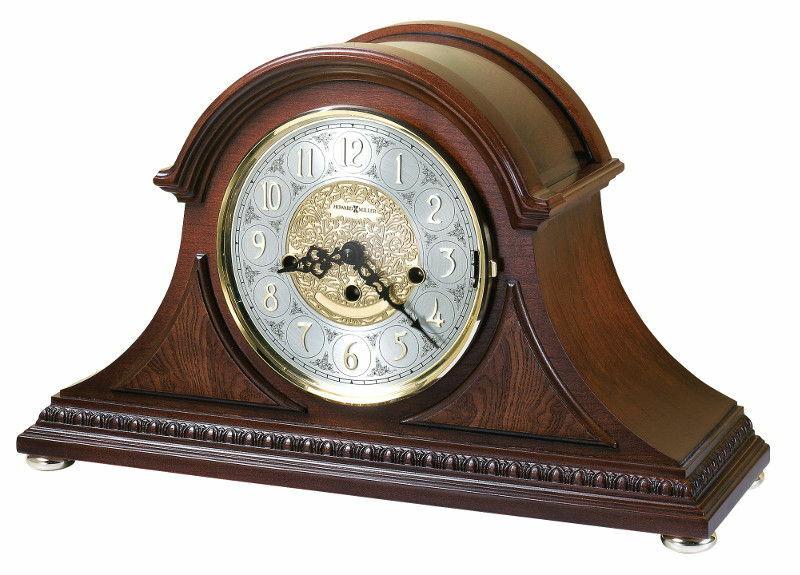 Beaded dentil molding above the full plinth base completes the look on these chiming mantel clocks. 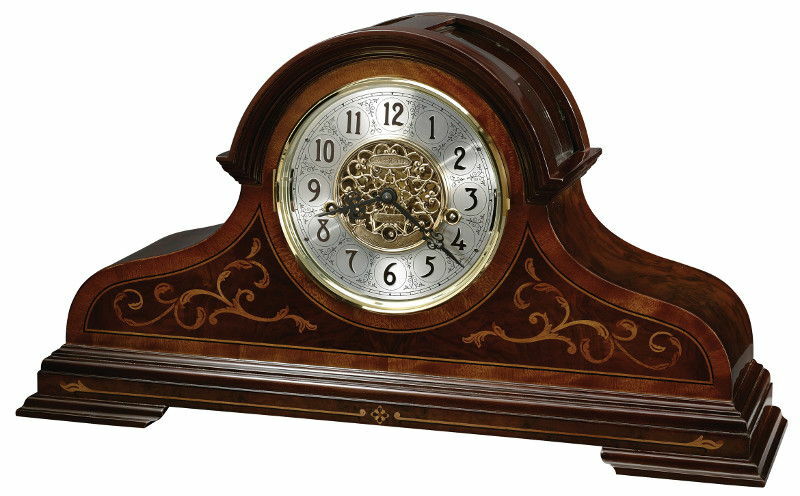 These traditional tambour style mantel clocks are rich in details. The warm white dial features black numerals and hands, and a brass-finished bezel. Fluted columns with wooden column caps grace each side. 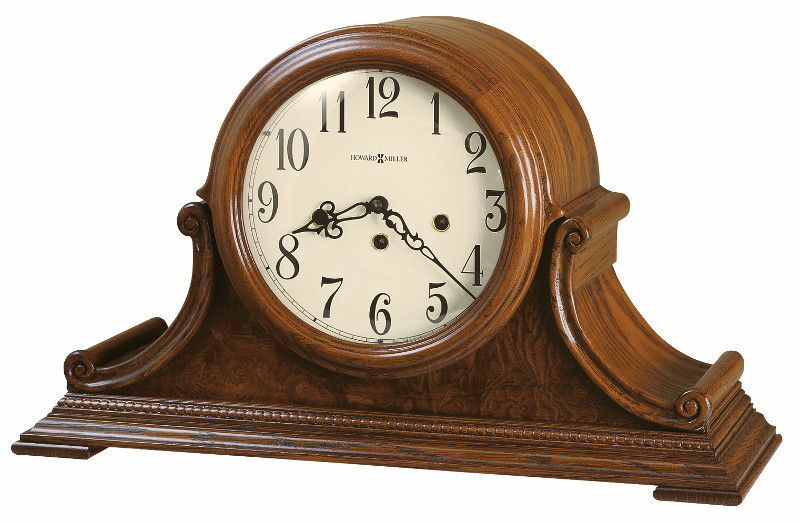 These traditional chiming mantel clocks are a classic. Off-white dial with brass finished bezel and Roman numerals. Hand glazed, finished in Windsor Cherry on select hardwoods and veneers. 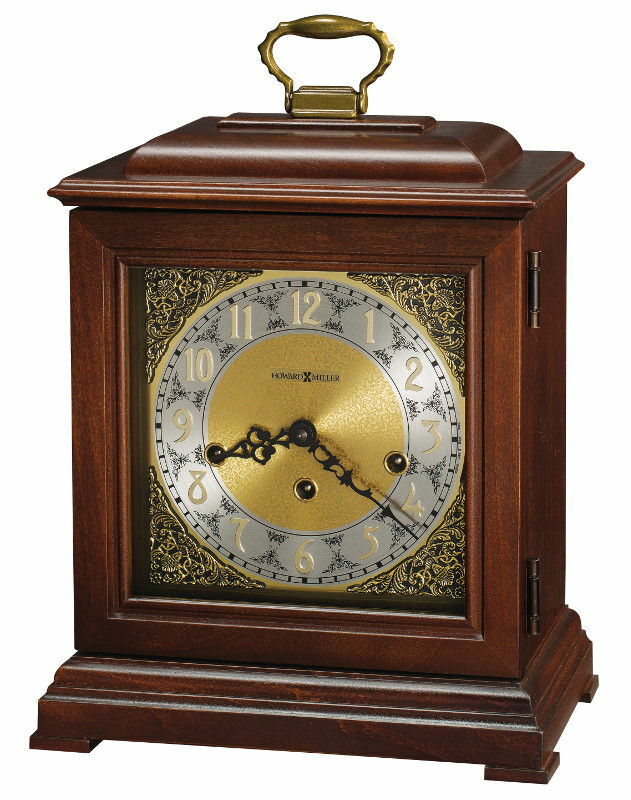 The polished brass-finished handle completes the bracket style look of these chiming mantel clocks. 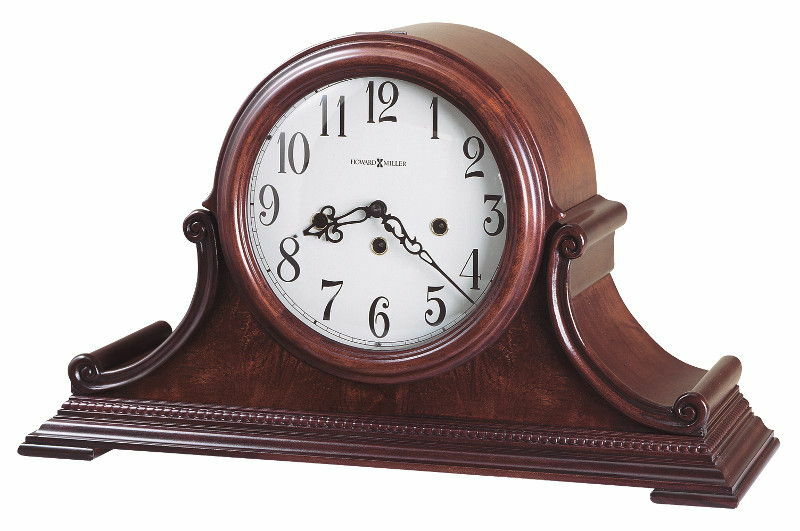 These chiming mantel clocks have a traditional style. Hand-glazed, named after the famous English clockmaker of the late 1600s. Rare olive ash burl veneers on the door and hand painted gold decorations accent the case. Glass sides and mirrored back reveal the movement. Brass finished dial offers silver chapter ring. 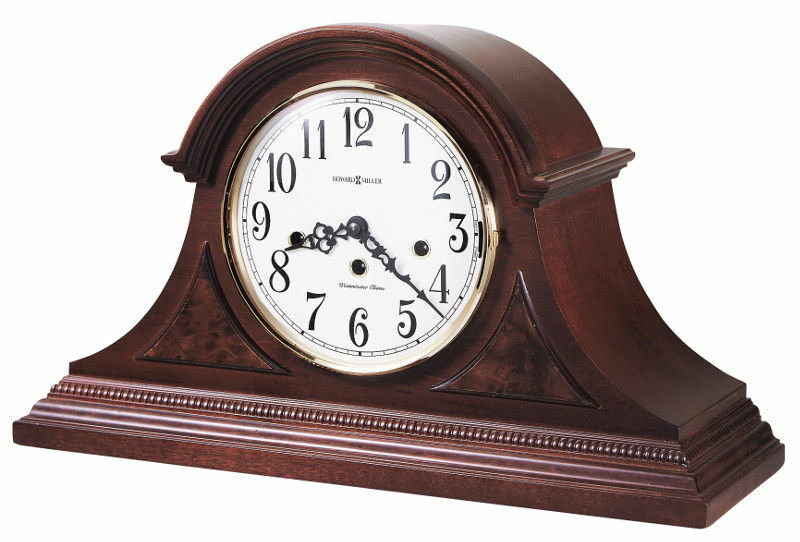 These chiming mantel clocks feature the classic bracket style. 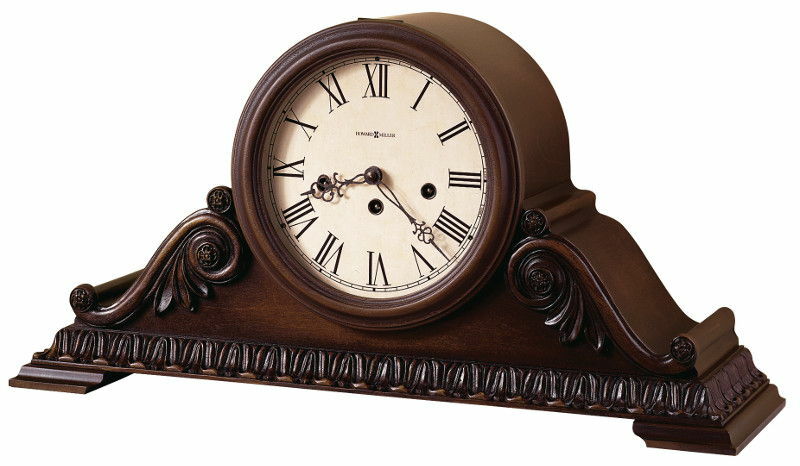 These antique-styled mantel clocks feature a lightly distressed finish and are rich in reproduction hardware, giving it a very authentic look. Carpathian Elm burl pattern on the front. 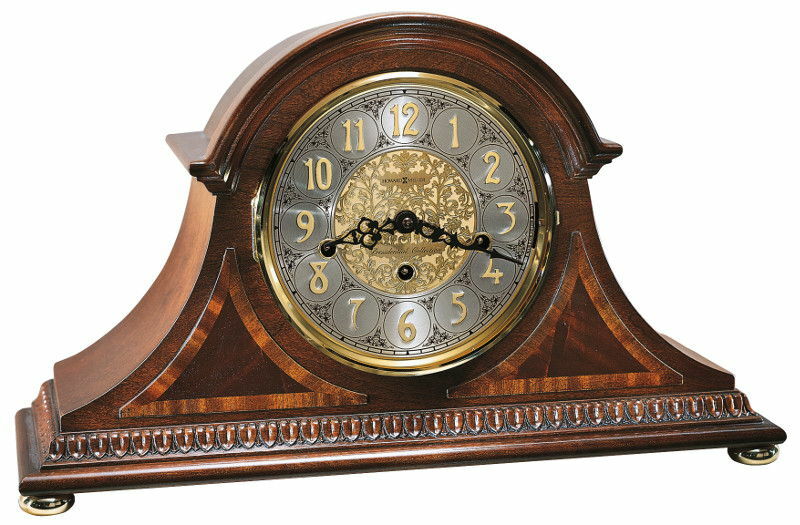 The ornate dial on these mantel clocks feature a pierced, polished brass cast center and applied satin black Arabic numerals on a silver chapter ring. The cast center disk is numbered and specially inscribed with "Limited Edition."